There aren’t too many time you can find an entire two unit building for sale and they are already condo converted. 229 and 231 Eureka are those condos. Interestingly, I showed 231 Eureka to some clients probably 9 years ago. I don’t remember the garden looking nearly as good as it does now! The upper unit, 229 Eureka, is an Edwardian two bedroom, one bath and formal dining room listed for $649,000. 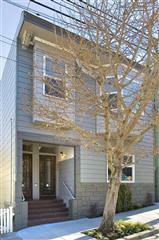 Nice detail, fantastic Castro location and a starter price. The kitchens in both units are clean and very usable, but room for you to make it your own. The lower unit is listed for $629,000. one plus bedroom, one bathroom and formal dining room. The garden is inviting and wonderful. Beautifully landscaped and hard-scaped. Oh yeah and a putting green. Your opportunity to use the entire place, or buy a primary residence and rental-currently with no rent control. Listed by Brown and Company Real Estate. Both condos went into contract with multiple offers right away! Upper unit sold for $650,000, lower unit sold for $637,000!